Can anybody out there please just make accurate 3D printed faces for Paxton and Sidney? Not gonna lie, I’d buy that. it looks very interesting. 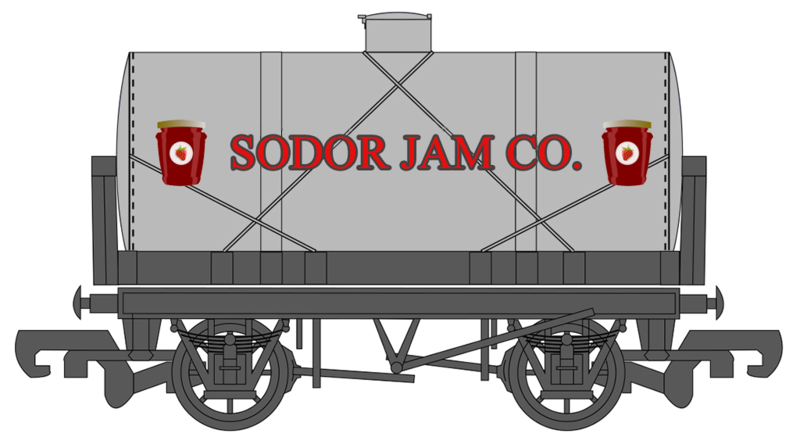 While I hope if Bachmann ever does make the Jam Tanker in either HO or Large Scale (preferably HO), they make it pure silver with no logos just like the ones in the Season 9 episode they're from and similarly to the Toffee Tanker. But if they made something like this, I wouldn't complain. It looks really sharp. Yeah, it looks great. But has anybody just noticed my question about 3D printed faces for Paxton and Sidney? While I was reading the new catalog, I noticed something. The separate sale Large Scale Thomas has been reintroduced. My question is why? Also Red Rosie is up for preorder on TrainWorld. Says she’ll be out by Late April, although I betting more on December or later. I would bet on later too, Rusty’s release date on there was March earlier this week, and is now pushed back to May. I’m starting to bet on the summer at this point for him, but I do appreciate the new design on the model’s body so maybe that’s why he is still not out yet. The Spring TCA show is coming up too. Definitely curious to see if Red Rosie or Rusty will be shown there too. The show's animation studio has just redone the 4 classic characters left in the main cast. Here are pictures of Thomas and Percy. Do you guys think this could affect how the N Scale models will look when they are released? I just don't know if they're going to make the rivet detailing. To some people it's unnecessary. I'm gonna guess no; Bachmann already has the Thomas CG references, and these little changes would not translate easily into N scale. It would be pointless and tedious for Bachmann include these new small details on already small models would likely increase the pricing on these models too. I don’t know why Mattel would push for these revisions on the renders, since they probably won’t bother to add these details to any of the merchandise that they are making, including the N scale models. Now, that being said, if these revisions do end up finding their way into the N scale models I could see them being a major dealbreaker to fans and would probably make them want to stick with Tomix if they want to model Thomas in N scale. So sticking with simpler designs for Thomas and Percy (and pretty much anyone else in the main cast whenever they would get announced) would be an all-around safer move on Bachmann’s end if they want the sales for this new range to take off. Who are the other two major characters that have been redesigned apart from thomas and Percy? Gordon and James. Gordon hasn't been fully shown yet, except for his front (he has an express headcode now), and I couldn't find a good enough picture of James. Apparently Emily has been redesigned a little bit as well, but I don't really consider her a classic character, so that's why I didn't include her in the count. It'll be interesting to see if they do this to Edward, Henry, and Toby as well.